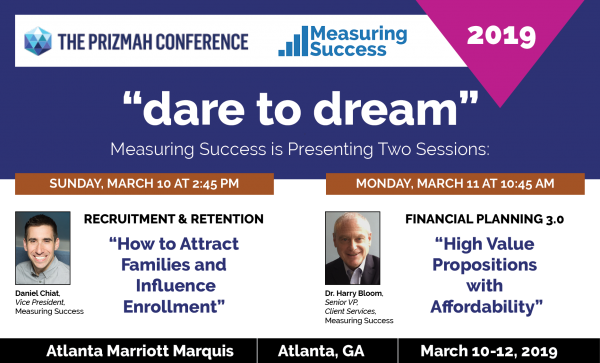 Look for Measuring Success presenters Daniel Chiat and Dr. Harry Bloom at the upcoming Prizmah Conference (2019) in Atlanta, Georgia. Organizers have set forth three days to learn about new possibilities in Jewish education. The event will take place March 10-12 at the Atlanta Marriott Marquis. To register, click HERE. Daniel Chiat, vice president at Measuring Success, will be presenting with Daniel Taibl, Director of Business Development at Enrollment Management Association, on the topic, “How to Attract Families and Influence Enrollment,” on Sunday, March 10 at 2:45 p.m.
Dr. Bloom, senior vice president, client solutions at Measuring Success, will be presenting on Financial Planning 3.0: “High Value Propositions with Affordability,” on Monday, March 11 at 10:45 AM. Over the course of three days, attendees will discover the latest creative models and innovative solutions to classic Jewish day school challenges; learn with peers and experts who will challenge strongly held notions and assumptions using research case studies, and their experiences to illustrate effective new ways of thinking; and tap into the energy and excitement that comes with being a part of something bigger than you and hit on the big-picture goals that will ultimately advance your school.